No need to confess if you do. But since digital piracy remains a problem, the Education Division of the Software & Information Industry Association (SIIA ) released “Don’t Copy That 2” as part of SIIA ’s ongoing effort to help teachers educate K–12 students about the ethical and legal use of copyrighted materials, such as software, books, articles, music, and movies. 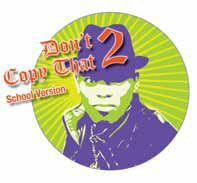 “Don’t Copy That 2—School Version” is a music video that addresses the dangers of engaging in piracy and the importance of respecting the creative output of others. The accompanying classroom resources include support materials for the video, lesson plans for middle and high school teachers, a glossary, and other resources that can be helpful to educators in teaching these complex and important concepts.